For more than half a century, Minnesotans have been treated to the memorable players and teams of the Minnesota Twins. 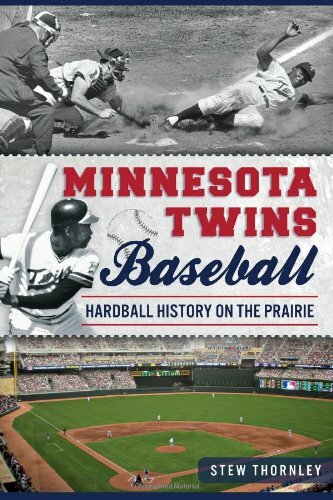 From the Ruthian blasts of Harmon Killebrew and Kirby Puckett to a successful brand of small ball," the Twins have fielded competitive teams at Metropolitan Stadium, the Metrodome and Target Field. But prior to its arrival in 1961, the team also had a storied past in Washington that included Walter Johnson, the greatest pitcher of the Deadball Era, if not all time. Sports historian Stew Thornley highlights the lesser-known events in the club's history, from the area's attempts to lure a major-league team to town in the 1950s to then-owner Calvin Griffith's campaign to regionally rename the team. He also pays tribute to the rich heritage of baseball before the Twins, marked by minor-league teams such as the St. Paul Saints and Minneapolis Millers, which produced future Hall of Famers Willie Mays, Duke Snider, Ted Williams and Roy Campanella." Sports historian Stew Thornley has written more than forty books. His first book, On to Nicollet: The Glory and Fame of the Minneapolis Millers, was a finalist in the 1988 Minnesota Book Awards and earned him a national research award sponsored by the Society for American Baseball Research (SABR) and Macmillan Publishing Company. Thornley is an official scorer for Minnesota Twins home games for Major League Baseball and for the National Basketball Association for Minnesota Timberwolves games.